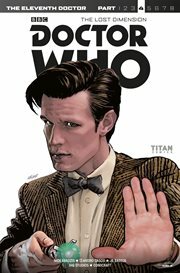 The item Doctor who: the eleventh doctor: the lost dimention, part 4, Issue 3.1, Nick Abadzis, (electronic resource) represents a specific, individual, material embodiment of a distinct intellectual or artistic creation found in Richland Library. The Lost Dimension Part 4. The Eleventh Doctor and Alice arrive in an impossible time, caught in an impossible moment of history! Can the Doctor resist making a change that could doom - or save - the universe?